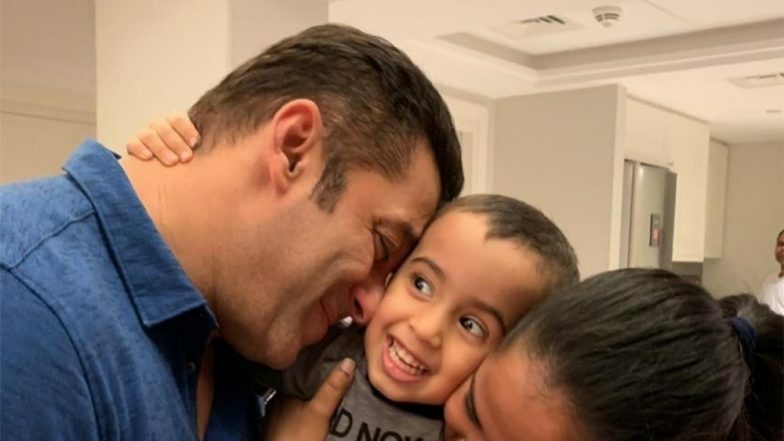 Salman Khan's Cute Picture With Baby Ahil Sharma Makes Fans Pine For His Own Marriage AGAIN! Salman Khan is known to be a sweetheart when it comes to kids! The superstar knows how to make them happy with his silly and adorable antics. His pictures with nephew Ahil are always the fan-favourites! Dabangg Khan has been showering love on this cute kid of Arpita Khan and Aayush Sharma since years now. Recently too, a new picture won his fans where he is seen with Arpita and the baby. Salman Khan Pokes Fun at Priyanka Chopra for Launching Bumble after Marriage. After Arpita posted this picture on her Instagram account, the fans once again became eager to see him getting married and have kids of his own! The burning question of his millions of fans as 'When will Salman Khan get married' still continues to be a rage. Sentimental pictures like this one make fans even more curious about his future plans. Some of the enthusiastic fans also requested his sister to convince him to get married to her friend and his ex-flame Katrina Kaif. Can you beat that? Anyway, check out this super-cute picture below. On the other hand, the fans are also eagerly waiting for his next film which is Ali Abbas Zafar directed Bharat. Like his fans would love it and always want it, he will be once again seen romancing Katrina on the silver screen. The fans rooting for them since forever, will get another chance to convince Bhai that how she is the perfect one for him! After Tiger Zinda Hai, the trio is reuniting for this actioner. Speaking of the picture above, we hope that Arpita takes fans' requests seriously now!